Well we went cruising again. Before I even finished my review of the last cruise! That’s not to say that I didn’t have enough time, I just get busy with life/kids/soccer/etc. and writing gets pushed down the list…oh, and I have a full time job too! So on Saturday, we piled the seven (yes, seven!) of us and all of our luggage in the car (one car!) and started down the road from NC to FL. It is about an 8 hour drive, but with my mom in the car, we probably didn’t go quite as fast as we might have otherwise! No sense starting off the week with a stressed mom, she had decided to join us at the last minute because she really needed to DE-stress! After an (mostly) uneventful drive, we arrived in Cape Canaveral. I had hoped to arrive in time to watch the Saturday cruise departures sail away, but we did not get there early enough (see above statement re: speed/mom in car!). We did, however arrive in time to check into the hotel and head over to Fishlips Waterfront Bar & Grill for a lovely early evening dinner and quite a few “I’m on Vacation” beverages! We had reserved the Park & Cruise rate at our hotel, but the shuttle for Royal Caribbean was not leaving until noon…WAY too late for us!! So I called and booked a (big) cab to pick us up earlier. We packed all of our stuff into the van at around 10:30am and headed to the Port. Check in was, for the most part, a breeze. We were shown to the priority boarding line (I say “line” but really we were behind one family and waited no more than 5 minutes. We had one glitch where the passport scanner mis-read the name but after that got worked out, we were on board and headed for a drink! We had pre-purchased the premium alcohol package for $55/day so we knew we needed to get our drink on so we could get our moneys worth! 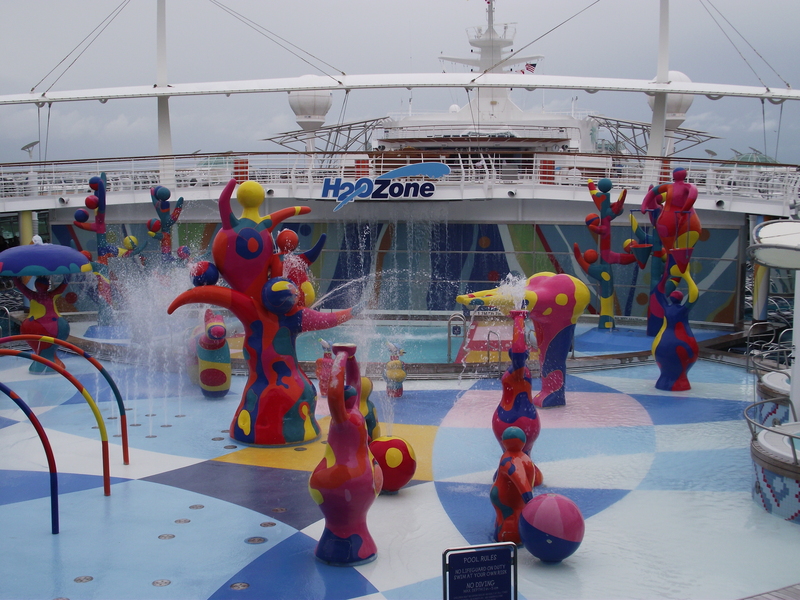 After the obligatory trip through the buffet line on the Lido deck, we headed for the pool to let the kids splash while we waited for the cabins to open up. After splashing around for a while…the kids, not me…we went to check out our cabins. We had three cabins on Deck 6, two side by side that overlooked the Promenade and one balcony just a few doors down. Everyone decided to unpack and get changed and ready for the Sail Away Party. We had been a part of an on-line “roll call” and the plan was to meet up at the Sky Bar at sail away. Since no one had met in person, we were all supposed to wear Mardi Gras beads so we could recognize each other. After the mandatory safety drill, we donned our beads and headed up to the top deck to meet the folks we had been chatting with on-line for months. Let me tell you, it was HOT!!!! And besides one other family, we were the only idiots wearing Mardi Gras beads!! They were functional however, as each of the adults had a shot glass attached to the beads…just in case! After it became apparent that no one else was going to show up wearing beads, we decided to find someplace cooler to hang out and relax. We ended up finding lounge chairs all the way forward on Deck 12, in front of the gym. There was a fantastic breeze and at that time of day, it was shaded so we hung out there until it was time to get ready for dinner. We had made reservations for Chops Grille, the steakhouse on board. 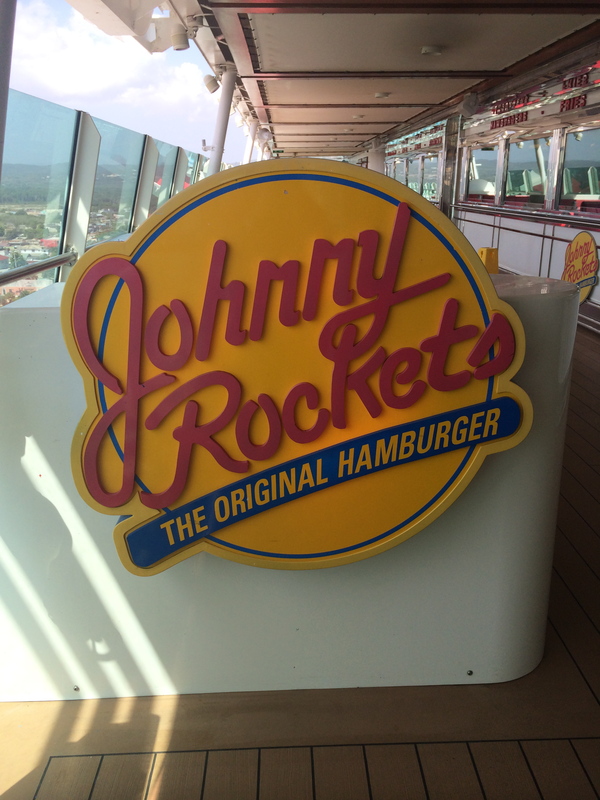 We knew that the toddler and the 11 year old would not appreciate the formal dining so we took them to someplace we knew they would appreciate: Johnny Rockets! Yep, greasy diner burgers and fries! With milkshakes! How could a formal dining steakhouse compete with that?? Unfortunately, the kids had the right idea, as we all felt that Chops was not worth the extra money we had paid. The food was only so-so and the service could only be described as adequate. It was one of very few disappointments on this cruise. Still, a bad day cruising is pretty much better than a good day anywhere else, right! And it wasn’t even a “bad day” just a bad dinner, that took forever, and that we paid extra for, and that we had really high hopes for based on other reviews that we had read…but still, one of very few disappointments that we had this week. We also had made reservations at Portofino’s for later in the week, and we now viewed that with no small amount of trepidation…would it be just as disappointing? We will see!! We ended the night at what would become our refuge: the casino! 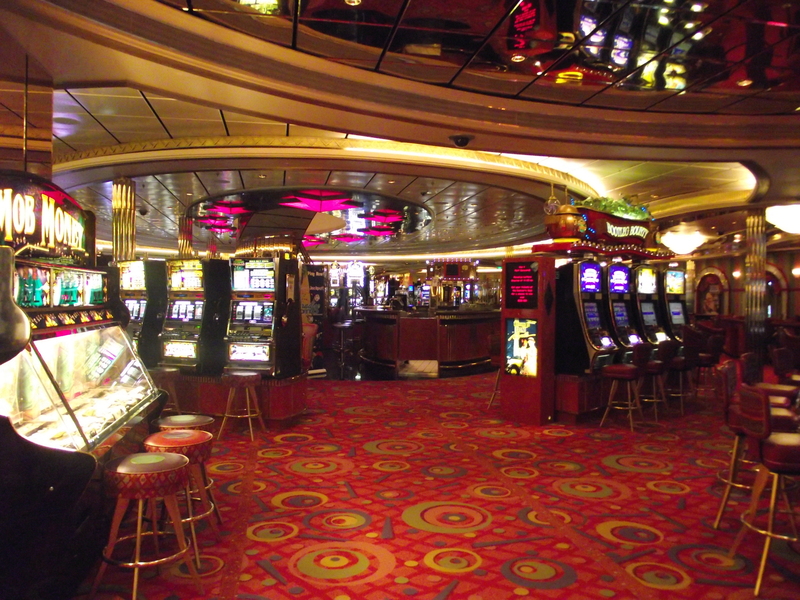 We love to play slots (although they did not love me this cruise!) and spent at least a little time there every day, in fact we participated in the slot tournament and two of us made it through to the semi-finals, and one of us made it to the finals! One of the best parts of our cruise was the Casino Host, Bryan. He was awesome! If you are ever on a Royal Caribbean cruise and Bryan is your casino host, go give him a hug, he deserves it! Part of the reason I love sailing on the Freedom of the Seas is that the staff on board, for the most part, is just THAT much better than other ships I have been on. Bryan is one of several “over and above” staff that made our cruise just that extra bit special.